THE NEW EU roaming allowances sounded extremely positive when first announced with promises of ‘roam like at home’ flexibility. 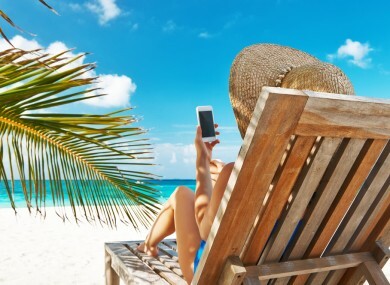 According to the EU Commission, travelers are meant to be able to “call, text and surf on their mobile devices when abroad in the EU for no extra charge on top of the price they pay at home”. However, the reality isn’t quite as straightforward. Overall it seems that texts and calls aren’t going to be the big issue – most providers seem happy to offer them at the same rate or in the same volume as included in your package here – the sticky issue is data. However, some networks are claiming their customers will, in fact, be able to roam like at home from 15 June – with customers able to use the data they’re entitled to here in the EU at no extra cost. As part of the EU’s plan, customers can make calls and send texts without extra fees – but it’s not so simple for the data. Data restrictions were agreed between the European Commission and mobile networks to help phone networks because of the wholesale charges operators charge each other for network access. However, if you’re on a two year contract where you get your phone for free as part of it, the mobile operator can deduct the phone cost from the calculation. If you’re paying €60 a month and have an iPhone 7 – that could eat up half of your allocation. In a statement to TheJournal.ie, Vodafone said that it will be implementing a full ‘take your home tariff abroad’ policy for mobile customers with no changes to other tariffs or package plans. This means that with the EU regulation we are not increasing prices, our tariffs stay exactly the same and customers will be able to use their tariffs with no additional cost in EU regulated countries. Three lost customers when it upped bills by up to €5 a month and brought in new terms and conditions. Under these, Three customers could continue to use all you can eat data (up to 60GB) at home but it was no longer a core part of the contract, instead being described as a ‘service benefit’. The ‘core’ part limit (which ranged from just 2 to 7GB depending on the customer’s plan) meant customers traveling in the EU would be hit with charges when they went over that core allowance. Three’s plan sparked an investigation by telecoms regulator ComReg into use of ‘core’ and ‘benefit’ categories. Three has since changed tack and will no longer allocate data into core and benefit for roaming. It also plans to offer a minimum of 5GB of roaming data for customers paying €20 per month. Customers will be charged €9.20 per GB once they go over their allocated roaming allowance. Meteor and Eir currently offer 1GB of EU data roaming to bill pay customers, something they started last year. A spokesperson said their customers will be able to use their minutes and texts anywhere in the EU from 15 June and “depending on their tariff, customers will be able to use all or a chunk of their data allowance while roaming in the EU”. We are currently communicating with customers via text to advise them of their allowances. The spokesperson said that customers will receive a text when they land in their destination letting them know how to check what data is available for roaming. From yesterday, Meteor also started reducing the credit period on pre-pay plans from 30 days to 28 days. At a recent press conference, Virgin Media explained that customers on the Unlimited Plan will receive unlimited texts, calls and 5.5GB of data when roaming in the EU, while customers on the limited plan will get the same allowance they do at home – 250 texts, 250 call minutes and 1GB of data. It said their average customer uses 2.7 GB per month and that if customers go over their allowance while roaming, they’ll be charged €7.70 for every extra GB used, 1c for every text and 3.2c per minute of calls. Carphone Warehouse-owned iD has 19 plans in total, 15 bill pay bundles with varying amounts of data, minutes and texts that customers choose and change each month, in order to build their own plan, and four pre pay options for €15 per month. Of the 15 bill pay options, 13 allow for minutes, texts and data used while roaming to be deducted from the monthly allowance, as they would if used while in Ireland. Two of its billpay bundles – it’s 7GB plan and 30GB plan – will only allow customers 5.6GB and 6.3GB of EU roaming data, respectively. Of the four options for prepay customers, three will give 100% of the usual call, text and data allowance given to customers at home. But the 30GB prepay plan will restrict customers to 3.3GB of data within the EU. This is allowed under the new EU rules as the plan only costs €15 per month. Email “New EU roaming allowances: Here's what phone companies will be charging from next week”. Feedback on “New EU roaming allowances: Here's what phone companies will be charging from next week”.